Sumit Malik won the men's Freestyle 125 kg decider by forfeit after Nigeria's Sinivie Boltic was forced to pull out with injury. Indian wrestler Sumit Malik won Commonwealth Games gold in the men's 125kg freestyle class on Saturday but caused a stew by biting an opponent. Bushy-bearded Canadian Korey Jarvis accused Sumit of biting him during their round-robin bout on the Gold Coast. The Indian made no attempt to deny it, cheekily passing judgement on how his rival tasted. "It occurred in the heat of the moment," said Sumit. "I am sincerely sorry that it happened -- but, no, he did not taste like tandoori chicken." 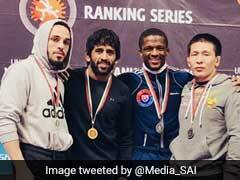 Defending champion Jarvis was hopping mad, despite finishing with the silver medal, as he did in Delhi eight years ago after a similar incident. "He poked me in the eye and then he bit me," he fumed. "It feels like groundhog day. I was winning in the last few seconds in Delhi and lost the gold medal -- basically the same thing happened today." 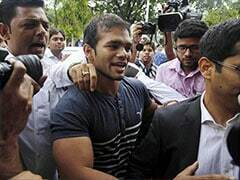 No action was taken to punish Sumit and Jarvis went on to beat Tayab Raza for silver. 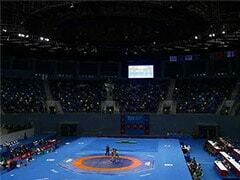 Sumit won the decider by forfeit after Nigeria's Sinivie Boltic was forced to pull out with injury. India enjoyed a happy penultimate day at the Commonwealth Games with eight gold medals in total, including three in boxing, to sit third on the overall medals table.